One need to adapt a controlled way of living …. Sounds simple – when practised – life will be normal, especially for those affected by a disease [it is stated to be a disorder ! ]….and ask those affected to find out how difficult is to control temptation [and not to yield to it !] …. Outwardly people will look normal – they can be of various walks of life; could be the most educated too…. still, given a chance of being alone in a party – they would jump to take more than the usual share of jamuns, lick ice-cream and more……some will say an additional dose of medicine will take care.. It is ‘Diabetes mellitus’ or simply diabetes [colloquially sugar] - a metabolic disease in which a person has high blood sugar, either because the pancreas does not produce enough insulin, or because cells do not respond to the insulin that is produced. Glucose, also known as D-glucose, dextrose, or grape sugar is a simple monosaccharide found in plants. It is one of the three dietary monosaccharides, along with fructose and galactose, that are absorbed directly into the bloodstream during digestion. Blood glucose monitoring is a way of testing the concentration of glucose in the blood (glycemia). Particularly important in the care of diabetes mellitus, a blood glucose test is performed by piercing the skin (typically, on the finger) to draw blood, then applying the blood to a chemically active disposable 'test-strip'. Different manufacturers use different technology, but most systems measure an electrical characteristic, and use this to determine the glucose level in the blood. The test is usually referred to as capillary blood glucose. Those afflicted by diabetes are to monitor their blood glucose levels at regular periodicities. For some of those affected, it is a daily struggle ~ others too strive hard to keep things under control, for, uncontrolled blood sugar puts people at risk for a range of dangerous complications, some short-term and others longer term, including damage to the eyes, kidneys and heart. Managing diabetes is too important. Glucose levels change frequently with normal activity like exercising or eating or even sweating. Sudden spikes or precipitous drops are dangerous and not uncommon, requiring round-the-clock monitoring. Tests can be painful though capillary test is only pin-prick. Some in advanced countries, who can afford wear glucose monitors with a glucose sensor embedded under their skin. Over the years, many scientists have investigated various body fluids—such as tears—in the hopes of finding an easier way for people to track their glucose levels. Google thought of miniaturized electronics— yes of : chips and sensors so small they look like bits of glitter, and an antenna thinner than a human hair—might be a way to crack the mystery of tear glucose and measure it with greater accuracy. The good news is that Google is testing a smart contact lens that’s built to measure glucose levels in tears using a tiny wireless chip and miniaturized glucose sensor that are embedded between two layers of soft contact lens material. According to Google, they are testing prototypes that can generate a reading once per second. They are also investigating the potential for this to serve as an early warning for the wearer, so they are exploring integrating tiny LED lights that could light up to indicate that glucose levels have crossed above or below certain thresholds. It’s still early days for this technology, but reportedly they have completed multiple clinical research studies which are helping to refine the prototype. The solution is not readily out there……..but there is more than a ray of hope for easy management of diabetes though there could be longway to turn this technology into a system that people can use. The news of Google testing new method is sweet for diabetes affected, especially at a time when International Diabetes Federation (PDF) is declaring that the world is “losing the battle” against diabetes. Worldwide, the glucose monitoring devices market is expected to be more than $16 billion by the end of this year, according to analysts. Google is the largest Internet search engine, and we ‘google’ so many things to know…. 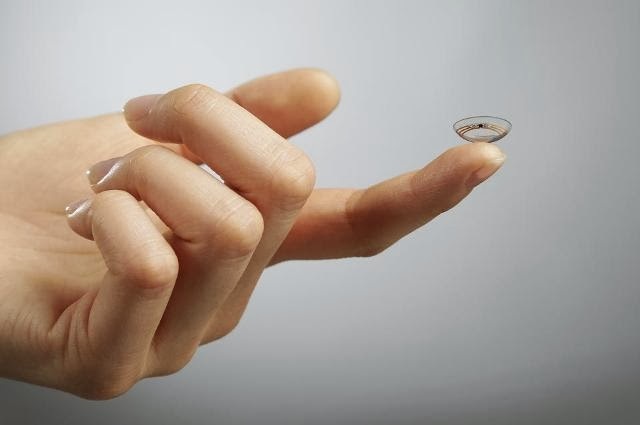 ‘Google’ getting focussed on a research outside its core activity really sounds sweet ~ the contact lens glucose monitor. The prototype, which Google says will take at least five years to reach consumers, is one of several medical devices being designed by companies to make glucose monitoring for diabetic patients more convenient and less invasive than the traditional finger pricks.